Against all the odds, the sun has been shining on England for a day or so. Wasting no time, the good doctor and I sprinted out into the garden for some husband-and-wife teatime. 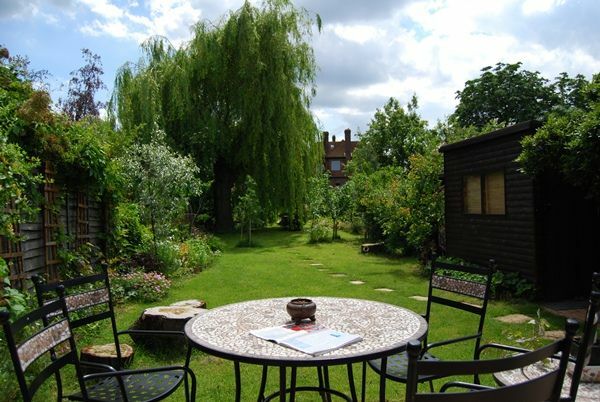 Separating the two halves of our garden is an old willow tree, which sways dramatically in the wind and gives the whole garden a soothing feeling of gentle motion, much like a seaview. The rustling sound from the leaves is much the same. The garden plays a background role in my tea drinking, as my teatable in the house looks out on it. 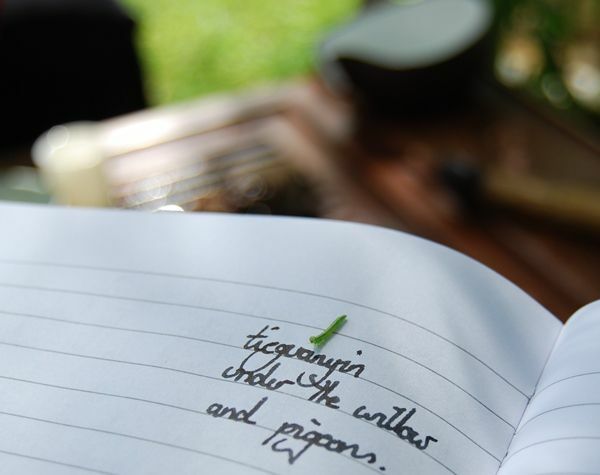 Perhaps you've come across it before: you may remember a haiku on Chinese characters growing in our flowerbeds. Many times do I stop to listen to that ever-present rustling. Sometimes, it reminds me of gentle sunshine, sometimes it is the tree losing its leaves in winter. Sometimes, it reminds me of my wife and her mother. 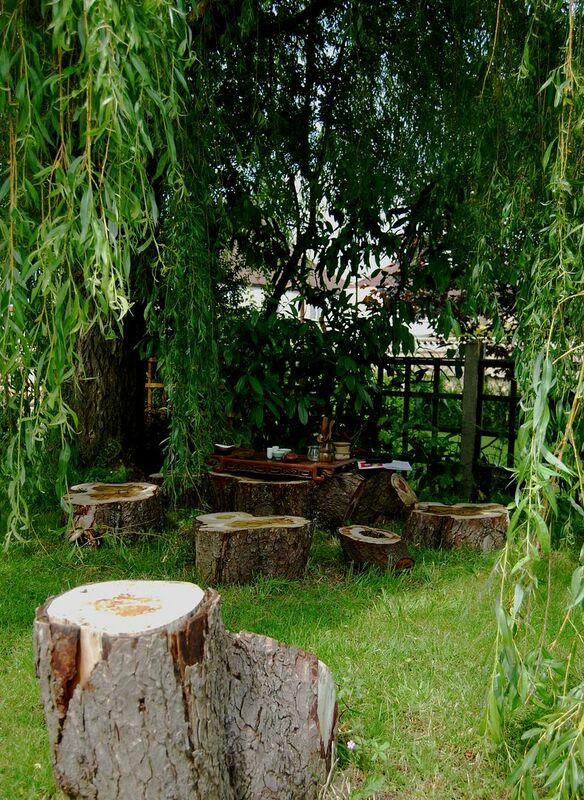 Always, the willow tree is there, drinking tea with me from a distance. 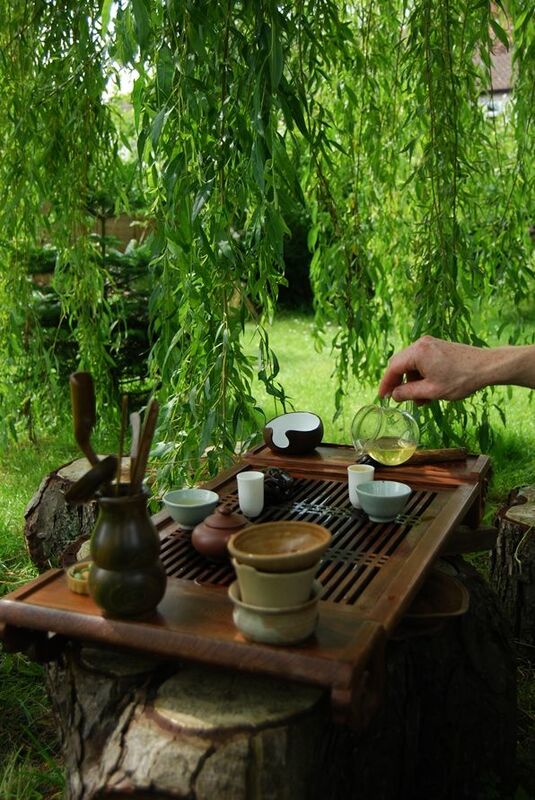 With the arrival of good weather, Lei and I managed to drink tea on the arrangement that Chinese Mama had created under our willow tree, during her last visit (pictured above and below). 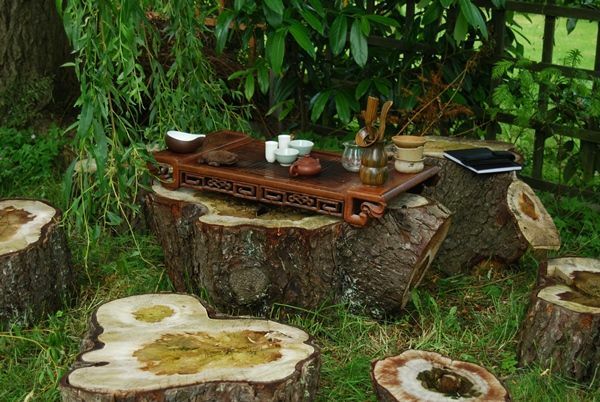 To celebrate our journey into the garden, we needed some tea to suit the mood. 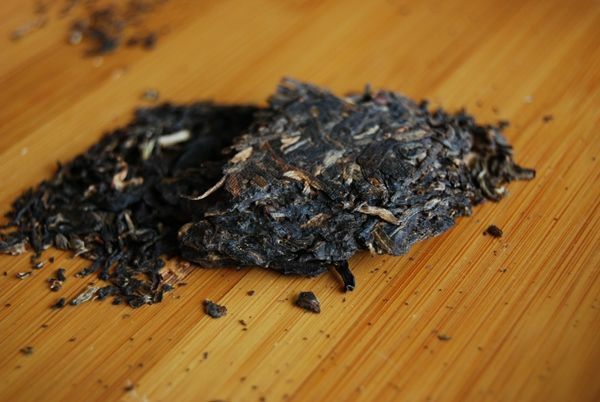 Given that the aroma is dominated by a wall-full of honeysuckle, it would be hard to drink something other than fresh wulong, which has an aroma almost identical to the honeysuckle. 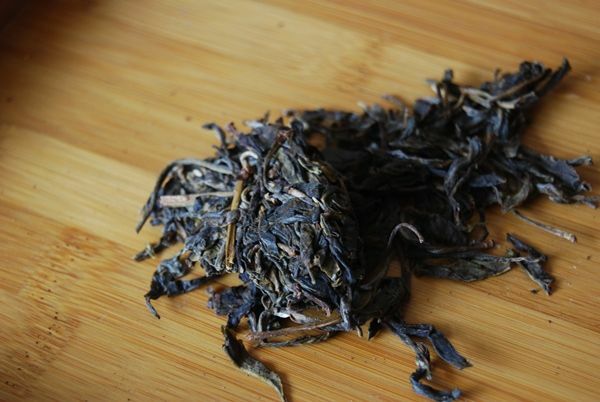 With thanks to Tom, a teachum from near to my hometown in East Anglia, we started on a "high mountain" wulong, which may have been produced by someone named Xu. It could have come from Postcard Teas, the lovely little London shop that I have mentioned before. 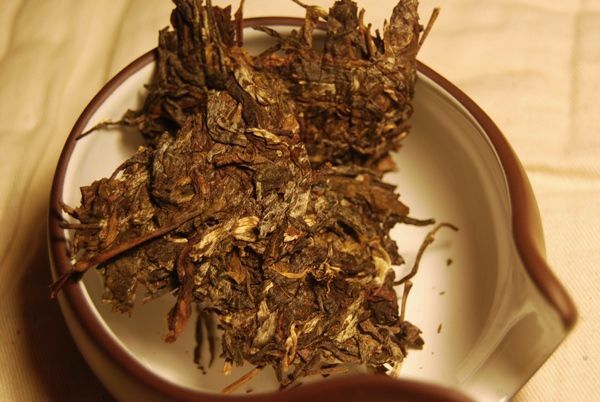 It is a fresh wulong in the "exceedingly green" genre, which was both very friendly and most enjoyable. 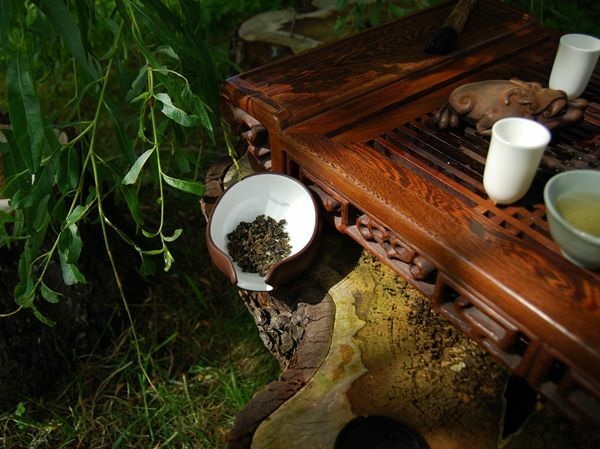 "Wulong is the perfect tea for the garden", quoth the raven-haired lady. With time on our side, we headed into roasted wulong territory, thanks to Superhans, our teachum from an American orchestra of international repute. When not making sweet music, Superhans clearly enjoys a good tea, pictured below. This is a lively recent picking, it seems, with a very decent roast that complements, rather than overpowers, the character of the leaves. The hours set along with the sun, and before we knew it, our wulong adventure was to come to an end, with the return of our (much beloved) family time. With special thanks to Tom and Hans. 2004 Jinuoshan "Youle", 1998 CNNP "Youle"
Youleshan is one of the old famous mountains of Xishuangbanna. These days, it is called "Jinuoshan", named after the "Jinuo" minority (who used to be called the "Youle" minority), one of the very many minorities (in contrast to the dominant Han) encompassed by the P.R.C. The leaves, pictured above, are small, but have very little scent. In the cup, it all goes woefully, terribly wrong: despite the fact that this cake is seven years old, it has a strong buttery flavour, as if it had just left the wok a few months ago. 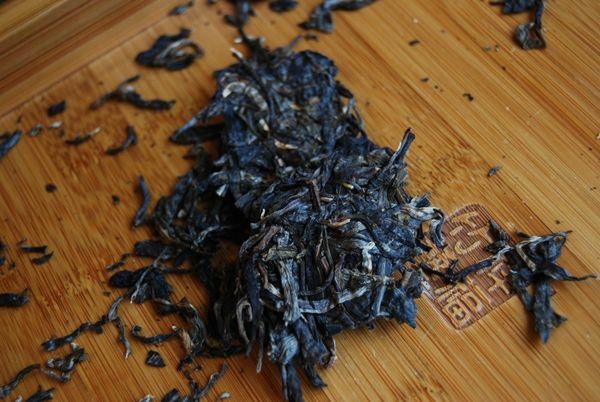 Most extraordinary is its floral, almost wulong-like floral characteristics. Bizarreness continues as the feeling in throat is a heavy, tar-like flavour of actual molasses and strong licorice. There is very little kuwei [good bitterness], and it is hard to identify this tea with pu'ercha at all. Heaven knows how such a character could be contrived. I dread to think. The fact that this cake, pictured below, is sold for just $37, despite its age, at Chawangshop suggests that there is an understanding that this is not the most exalted cake to reach the market. 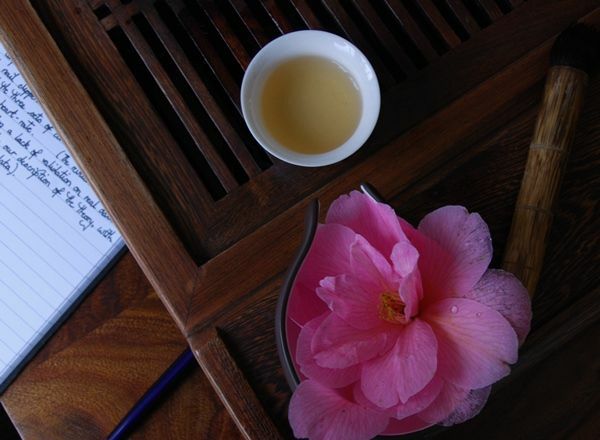 The notes on the company's web-page note a "peachy fruitiness", which could be the wulong-like floral aspects that I found. 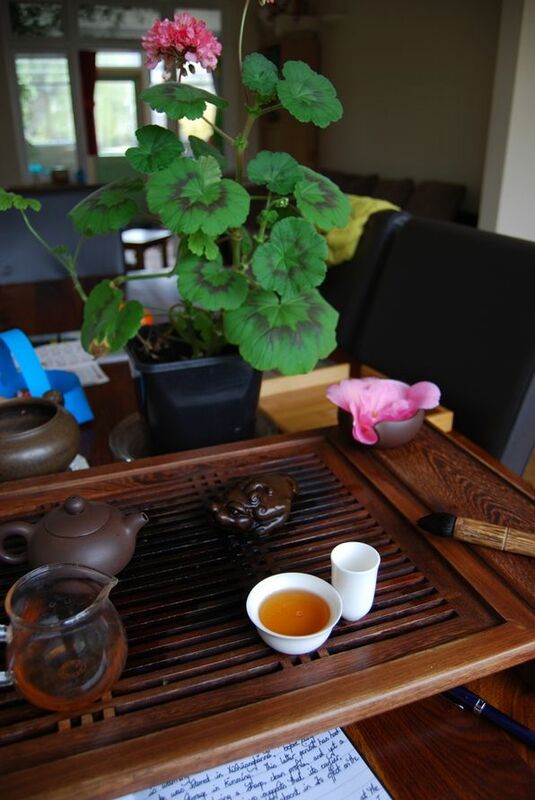 I drank the above tea on a public holiday, and thought "I need some real tea", to continue my session. I turned to the safety of the 1998 CNNP cake from the same region. This little fellow is sold for just $68 at Chawangshop. The compression, as you may probably deduce from the photograph above, is tight. You can make out the imprint from the hydraulic press. The leaves are small and fragmented, suggesting that this is a more down-to-earth production, in line with its reasonable price. The leaves are so compressed that I assumed it would take a while for the soup to lift off, but the first infusion turned out to be warming and decent. Chawangshop notes that this cake was stored in Xishuangbanna, which is a decent place to keep tea, thanks to its humidity and temperature, before being moved to drier storage in Kunming. This latter period has had a noticeable effect, producing a sharp, clean profile. 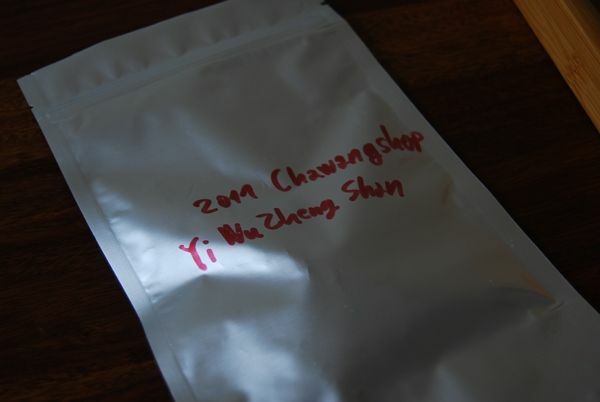 However, a background of rich spiciness suggests that its earlier, more humid, storage is not absent in its effect. 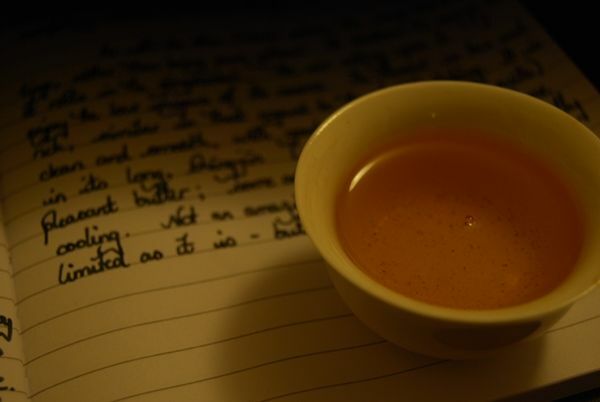 Perhaps expectedly, after its spicy, "red" warmth has passed, the tea becomes a little more ordinary. It fills the mouth well, and has a gently cooling sensation. 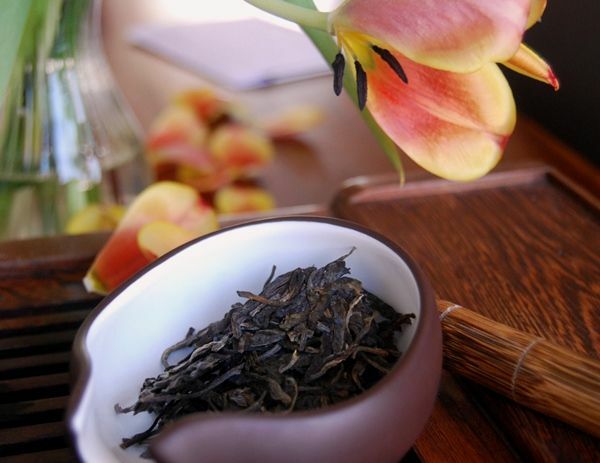 While it has no real huigan [returning sweetness in the throat], it might be more fair to say that it has "huitian": a shorter sweetness, that is not the deep throaty resonance of real huigan. I'm grateful to Jakub for this pair of teas, and particularly enjoyed the second, whose stable, warming character was welcome on a cold day. 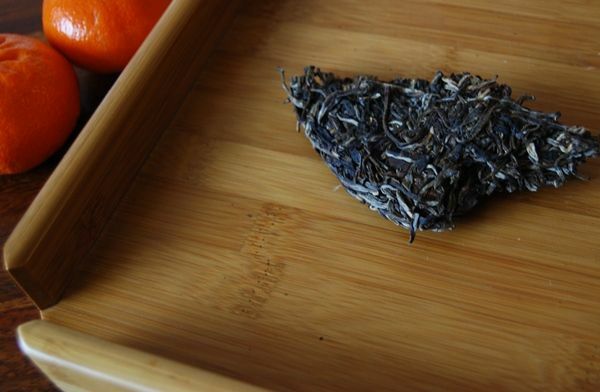 2011 Charen "Guafengzhai, Luoshuidong, Dingjiazhai Autumn" and "Laoman'e Summer"
So, we meet at last, Other Teas from Tea Urchin. 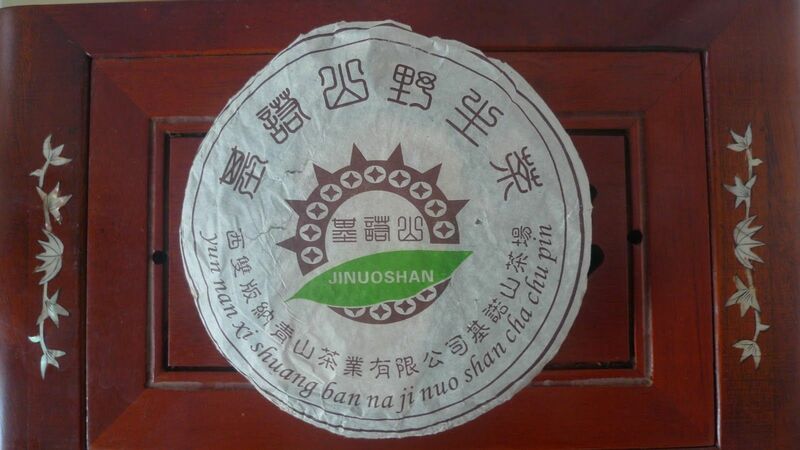 Today's article collates a set of teas kindly provided by Eugene, the Strahlian force behind the Tea Urchin shop, whom I suspect may have more than a little Chinese DNA in his own ancestry. If you've not yet checked out his shop, I urge you to do so, for the aesthetic appeal as well as the tea. 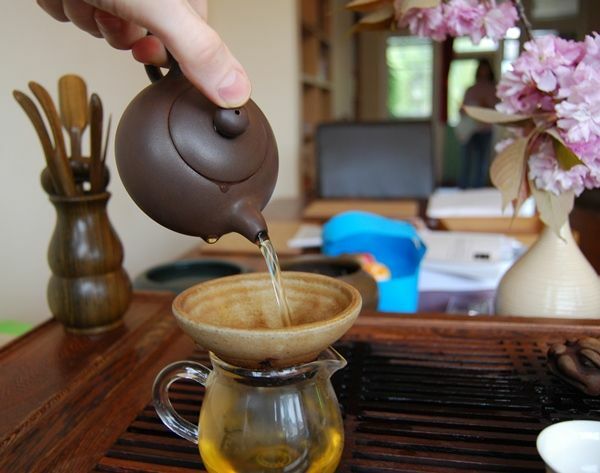 Given the appearance of most on-line tea businesses, Tea Urchin stands out. The first bite is taken with the eye, after all. The cakes pictured above and below (the Guafengzhai and Luoshuidong) are both samples covered by this article. I've been impressed with those cakes that I have described so far (the Charen Bangwei, and a pair from Gaofachang). However, I alluded to the fact that some other cakes have impressed me less; I cannot dissemble - "honesty is the best policy". So, here we go. If you're the owner of Tea Urchin, you may wish to stop reading now. All four of these cakes struck me by being obviously red when dry. Alarm bells rung the very moment that I examined these; my notes for each express sentiments on the same theme: "Uh-oh, red leaves." Perhaps these are, in contradiction to my previous experience, red leaves on an unaged cake that are somehow powerful and potent. Perhaps. Let's find out. It may not be obvious in the images below, due to the eternal battle between me and my camera's colour balancing functions, but it's unarguable when seen under daylight. The aroma (when dry) of each tends to be quiet and muted, in accordance with my prior assumptions for red leaves. Uh-oh. However, before we dive into the characteristics from the soup, we must pause to make mention that all of these leaves, apart from their colour, are very pretty to gaze upon. The leaves are well-handled, they have a decent shine, and retain much of their original fur. The appearance of the leaves suggests that Eugene knows how to select good leaves. 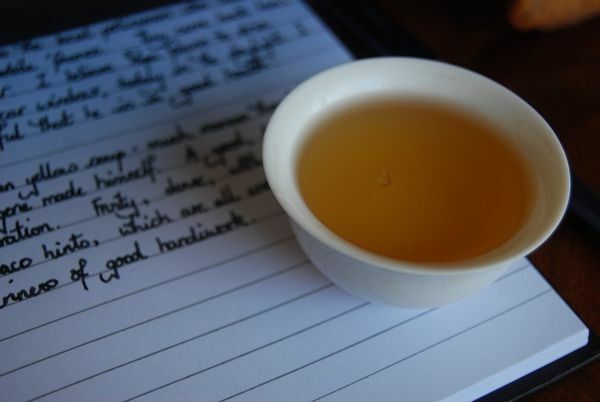 Alas, the pinmingbei [tasting cup] tells the same story in each case, for the Guafengzhai, Luoshuidong, and Dingjiazhai. (I will come to the Laoman'e later, which is a different story.) Each of the three former cakes are from the same region, being Yiwu-area cakes, and are all autumnal. I found each of the autumnal trio to exhibit the same character: the orange soup is constrained, limited, unexalted, unenduring in the throat, and tends towards the flavour of "hongcha". 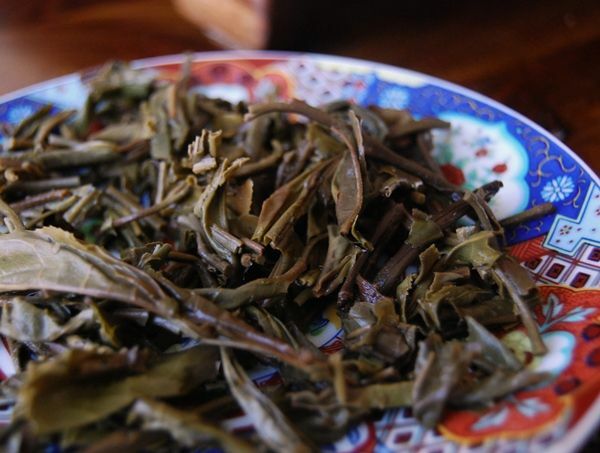 In every case, the quality of the leaves is clear: trying to make themselves heard from under the smothering blanket of hongcha that has robbed them of their charm, the leaves exude a cooling sensation, and have some vibrancy on the lips and tongue. Each of these three orange autumnal teas disappointed me, because such limited teas have a very "low ceiling", that prevents me from enjoying them to a great degree. I put this to Eugene, feeling rather terrible for doing so. After all, this is a man's livelihood with which I am taking issue, and I wish for nothing but success for what seems to be such a labour of love. Eugene took it all in his stride, and noted that the autumnal leaves tend to be much heavier in terms of water content that the premium spring leaves. This leads, he tells me, to his producers erring on the side of caution when it comes to the wok - they keep the leaves in the heat for as long as they dare, to remove as much water as possible, but they cannot push too hard lest they burn the leaves. 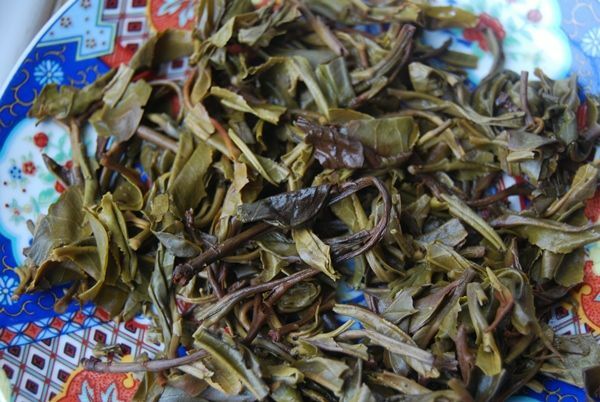 The result is that shaqing is not completely performed, and the leaves therefore continue their oxidation - much as hongcha, hence the characteristic that I had encountered. He noted that Gaofachang cakes managed to mitigate this effect to some degree by careful removal of red leaves from the blend after processing had been completed, which accounts for the substantially higher prices of the Gaofachang cakes compared with the Charen cakes. 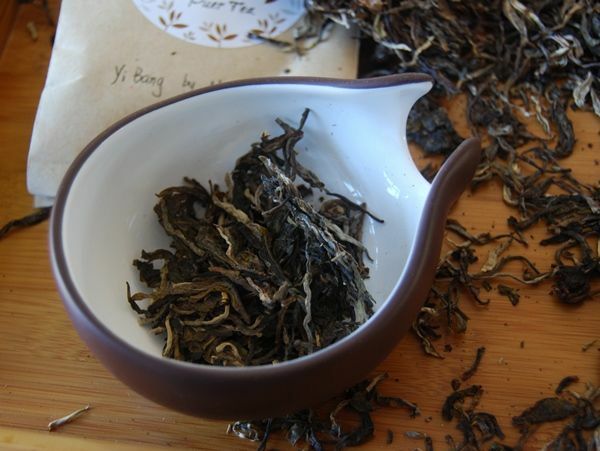 My notes have: Guafengzhai ($97/357g), Dingjiazhai ($65/357g), Luoshuidong ($43/357g) compared with the Gaofachang spring Mangzhi ($102/357g) and Gaofachang autumn Yibang ($85/357g). 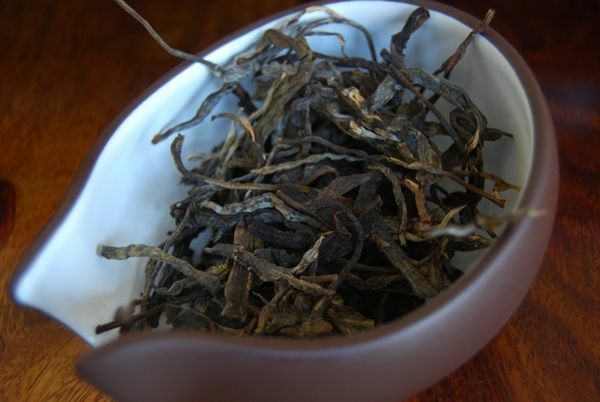 The result, then, is a very large quantity of tea that is "capped", rather limited, and which has strong hongcha overtones. 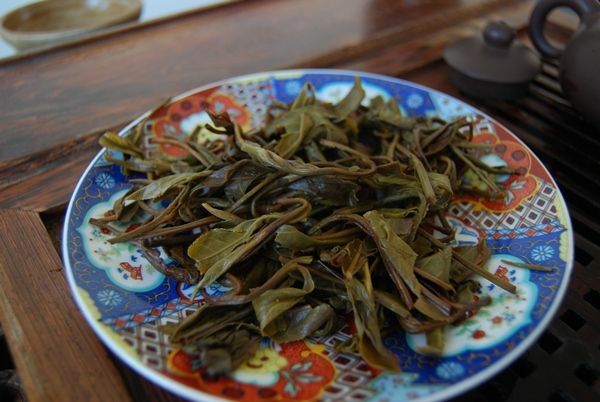 The colour of the Guafengzhai leaves below speaks volumes, for example. I mentioned above that the Laoman'e cake was different, and indeed it is: the leaves are from summer, not autumn, and the price is a reasonable $41/357g. While there are a few red leaves, they are in the great minority, when compared with the majority of proper green leaves. This soup is different, in that it has a green-brown shade; the second infusion develops a kuwei [good bitterness] far in advance of the trio of autumnal cakes, and has some "rustic honey" within its fairly limited scope. The body develops floral scents, and it dwells nicely in the throat. I wrote that "it is absent its heart", in that it seems empty in the centre of its body. 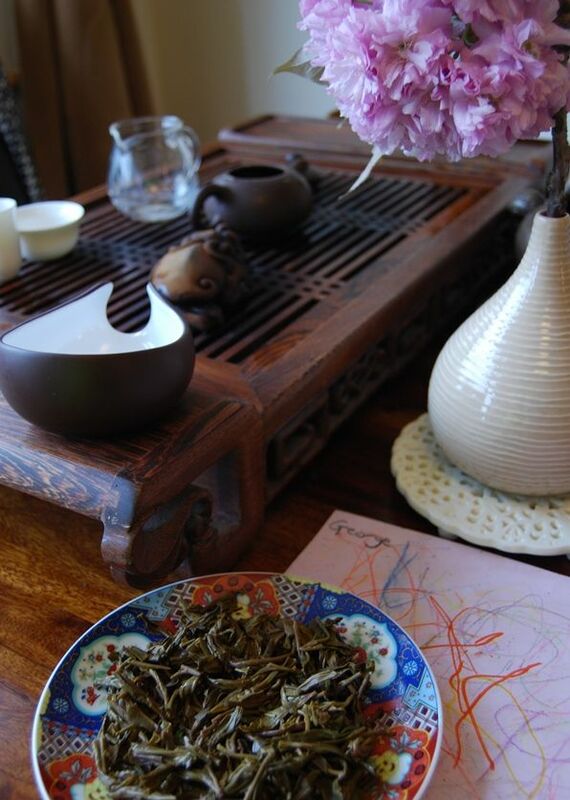 However, it is a great step up from the previous teas, and I stick around at the tea-table for a long time to see how it develops. Making autumnal cakes seems fraught with difficulties, and I am not entirely clear why people continue to push ahead with making them. 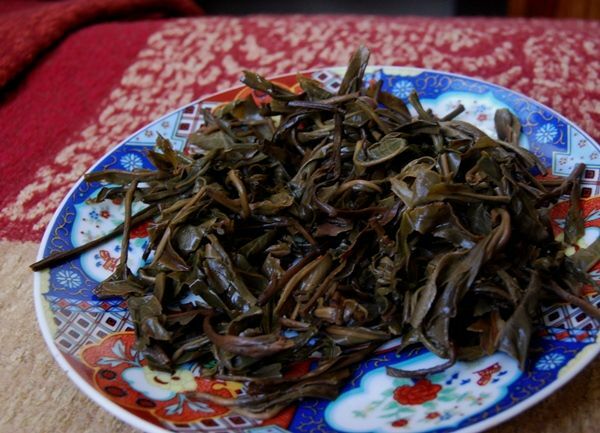 Eugene can pick excellent leaves, as evinced by the good underlying characteristics of the maocha in each of his productions, but the results for autumnal leaves are not excellent to my mind. Who am I, a laowai, to say how a man should run his business? I share with you only my opinions, such as they are, for you to compare with your own conclusions. 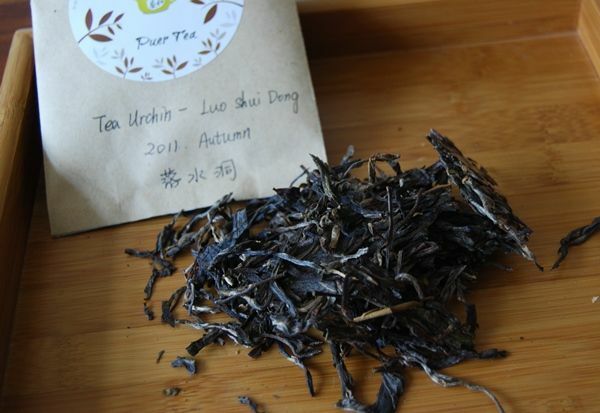 It is my hope and expectation that Tea Urchin will join the ranks of my favourite suppliers in the coming years, to give us more of those cakes that the excellent spring Bangwei demonstrate are possible. I understand that, since writing this article, some 2012 cakes have become available, which, most importantly, are spring cakes. 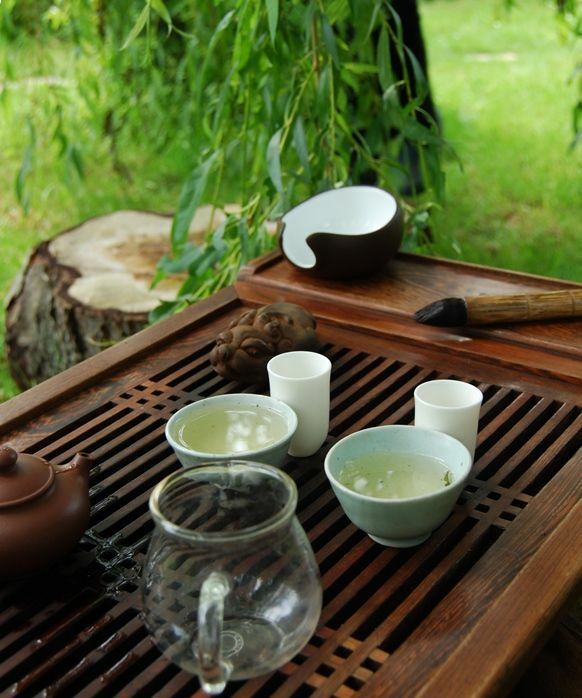 Running a tea business much be exceedingly difficult. 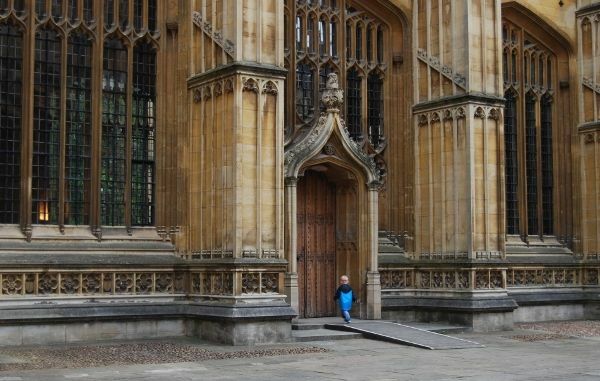 Jakub writes the blog known only as "T", which I have been following for some time now. I wrote recently that Eastern Europe has a thriving pu'ercha "scene", and Jakub is certainly part of that sphere. He recently sent me a parcel most mighty, crammed with samples of all kinds that I have read about on his blog, and so look forward to comparing notes. 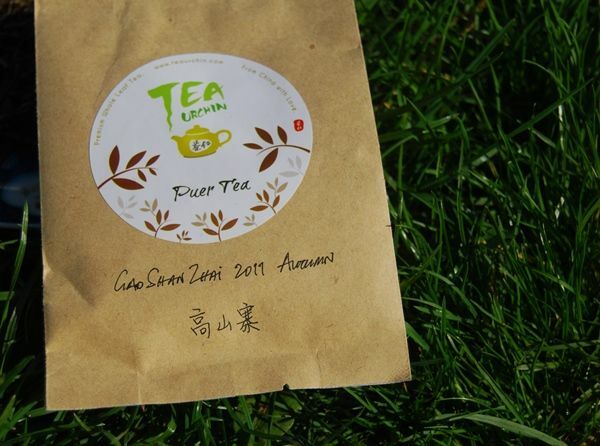 Every self-respecting tea business has to have its own line in pu'er cakes, it seems, and Chawangshop is no exception. This is not an outfit with which I have any experience, and so a chance to try their own-brand Yiwuzhengshan seems like a good point of first contact. 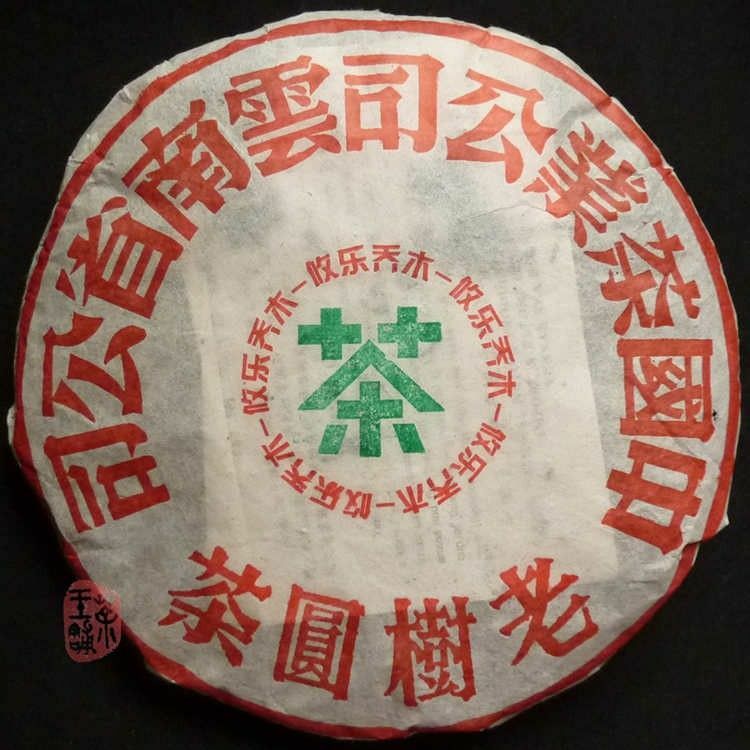 Some years ago, "YIWUZHENGSHAN" had to be on every successful cake, somewhere on the wrapper. Now, of course, it's all about the tiny little village from which the leaves derived: your Guafengzhai, your Mannuozhai, &c., &c.
I rather like the opportunity to go back to this bygone age of Zhengshan. The leaves are... rather orange. This may not be obvious from the photograph above. In the drizzle of the English rain, the prospect of drinking (yet another) orangered cake does not thrill me. If there is one sign that is correlated most tightly with weakness in an unaged cake, its orange leaves - in those I've tried, at least. I simply cannot recall the last time that I had an unaged cake that was orange, but which was strong and powerful. The aroma of the dry leaves is, in keeping my with assumptions, almost absent. However, it takes a turn for the better in the cup. I rather wish I'd thought to take a photograph of the soup itself, which is clean and which has a very fresh, sweet sugariness in the wenxiangbei [aroma cup]. 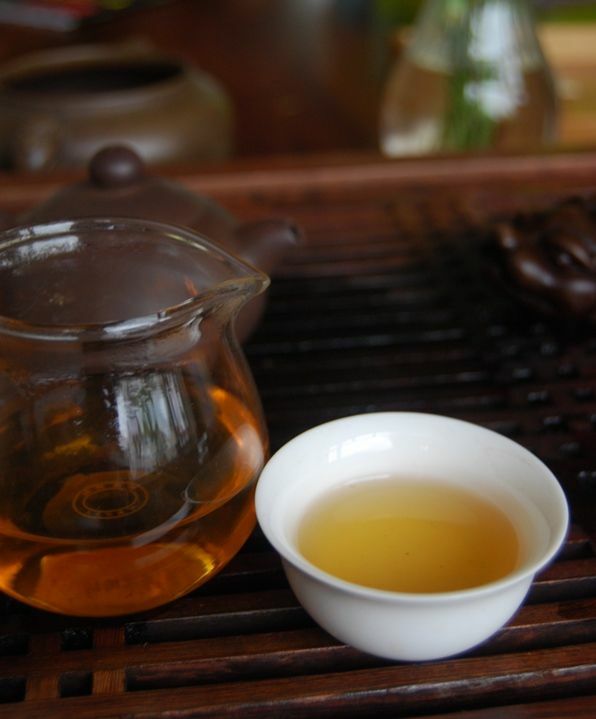 "The charm of a smooth, particularly sweet Yiwu with a silk-like body greets me, and comforts me, on this wet Saturday morning." My diary. 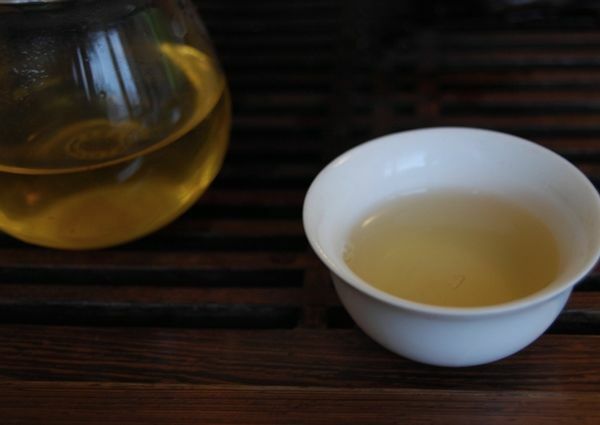 It is not a powerful, bitter Yiwu, but its silky, soapy sweetness is most enjoyable. Not much occurs in the throat, it is true, but the gentle sweetness push on for a fair while before fading. This cake will not age well, I suspect, because its orange leaves lack any notion of endurance or potency; it would be easy to imagine this wispy cake fading away as the years pass. 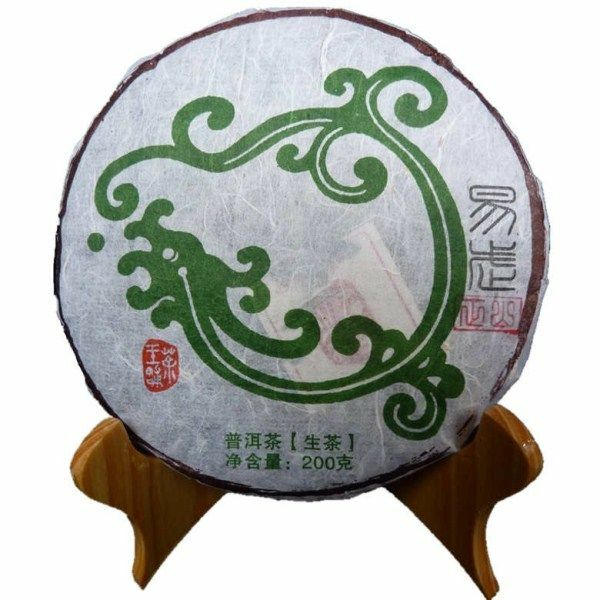 However, it is a fun cake for drinking immediately, and, best of all, its price is a respectable $14/200g ($25 / 357 equivalent), which is an honest, unassuming price for an honest, unassuming tea. A good session. Not one that I would follow up, but enjoyable due to its silky sweetness. I didn't quite realise how lively the pu'ercha "scene" can be in Eastern Europe. I have recently been exchanging samples with teachums old and new from places around Slovakia and the Czech Republic (both beautiful areas of the world, and famous holiday destinations for the English), and am impressed by just how much tea you chaps are drinking. And good tea, too. 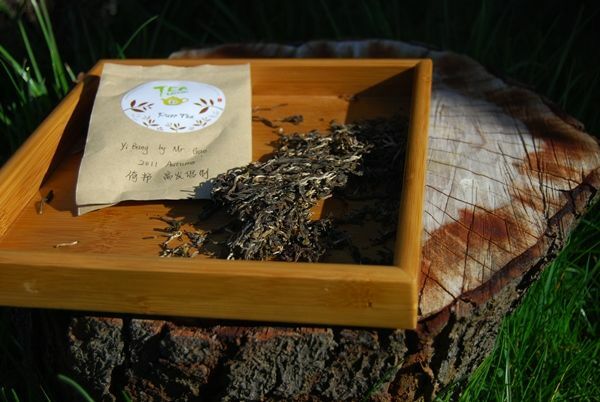 Following the trend, it should be unsurprising to know that there is a new tea business catering to this burgeoning community, and to folk further afield such as those in damp old England. 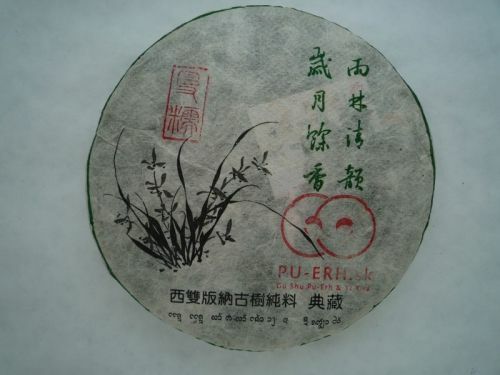 Peter of Pu-erh.sk very kindly sent me a package of some of the hand-selected cakes that he has started to sell. They look darn good, to be honest. The last time I had a cake from Mannuo, it was the leviathan from Essence of Tea. Actually, I think that might be the only other cake I've had from Mannuozhai. I bought a tong of it. So, you might say that this cake has a lot to live up to. Happily, it stands on its own just fine. 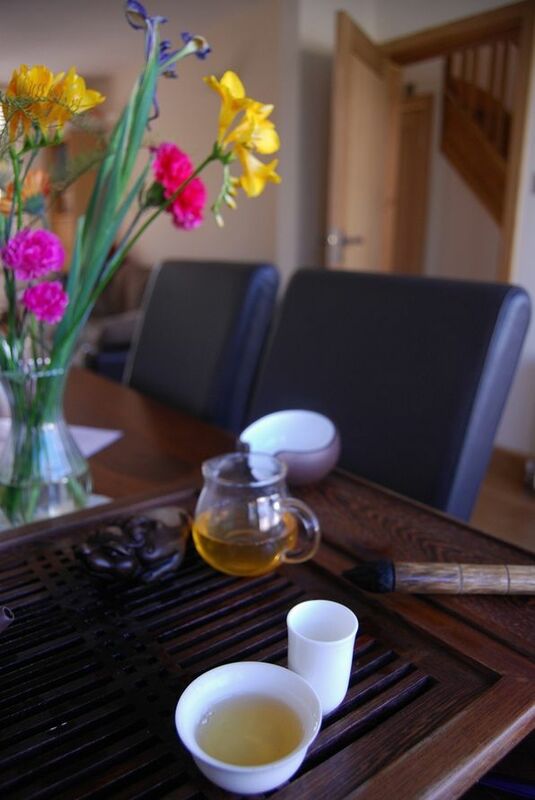 My mother, who is visiting us for the week-end (although I suspect she's really visiting her young grandson) passes by the tea-table and notes the sweet aroma of the leaves, so obviously has it filled the room. "This seems as if it might be a first-class tea", I seem to have written. The soup, pictured above, is a dazzling yellow, which has the heavy, sweet scent for which one would hope. Satisfaction is a cup filled with smooth, slick texture; vibrancy on the tongue of an almost effervescent nature; everlasting sweetness in the throat. In common with the Mannuo from Nadacha, this has low, punchy fruity characteristics, blended into a base of clean cereal. There is a lot to discover, and I greatly appreciate teas with the complexity and strength to keep me interested over a long tea session. I'm not a difficult man to please when it comes to tea, but I really appreciate the fine detail of this cake. I keep adding leaves and am rewarded with thicker and stronger brews. The kuwei [good bitterness] is forthright and uncompromising, and yet it is bound up with the charming characteristics that I described above. At $33/250g ($47 / 357g equivalent), this is priced nicely. In real money, it is £29 for 357g, which compares well its peers (which are becoming ever more expensive). I have to say that, excellent as this tea is, it does not quite scale the heights of the more expensive Nadacha cake, but it is a close-run contest. If you are looking for more Mannuo, or just darned good tea at a decent price, you really should consider Peter's cake. I had a thoroughly enjoying morning with it - thanks again for the sample. The storm-clouds briefly part, affording a glimpse of the sun. Visitors to England would be forgiven for thinking that this country is a soggy, chilly land perpetually covered by grey clouds. My own lab is filled primarily with researchers from overseas, and they like to make it clear that, as the resident Englishman, the weather is my fault. To my colleagues, I can only apologise. However, as the image below will testify, we have sunny days. Once in a while. What better way to celebrate than with one of Eugene's cakes from Tea Urchin? The amusingly-named "Gaoshanzhai" [high mountain village] is an Yiwu-area village, and has been cropping up in producer's repertoires more and more often. Shown below, these leaves look mighty fine. 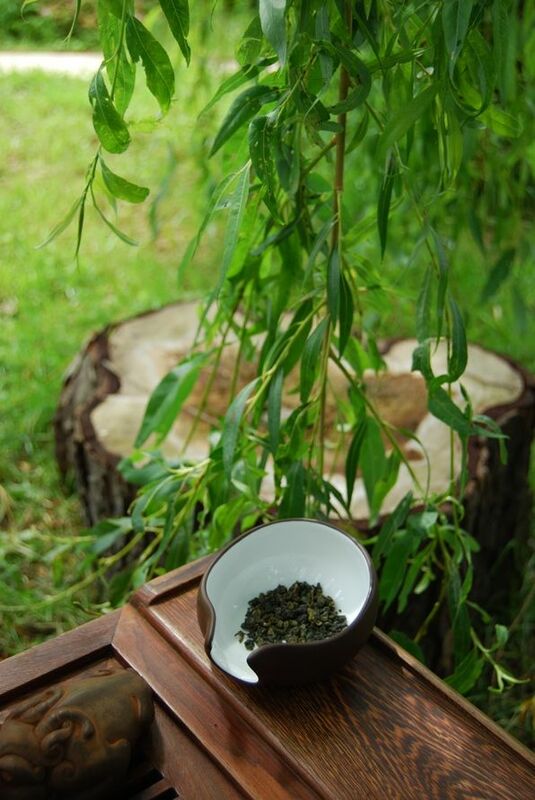 The maocha consists of some of the longest leaves that I have seen in quite some time. 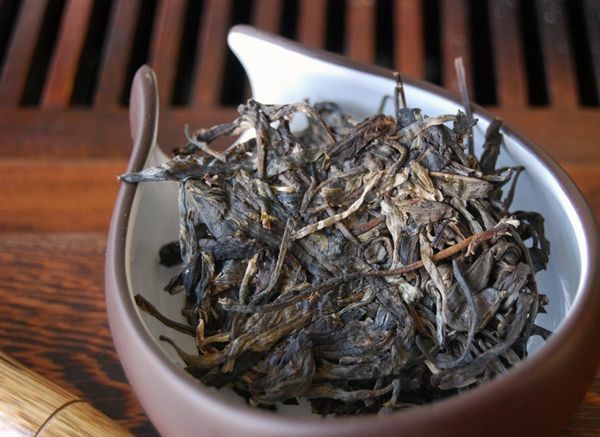 They exude a very decent low, fruitiness, which is in keeping with the reputation for floral and sweet characteristics from this Yiwu village. Pictured below, the leaves are so long, in fact, that I have to pre-moisten them such that I can bend them to get them into the pot without breakage. 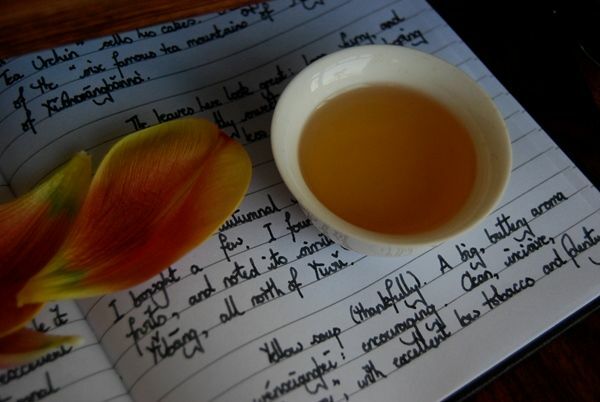 With leaves as luscious and long, surely the character in the cup must be similarly excellent. The solidity of the yellow soup has a hint of green, a sign of extreme youth and very decent processing - neither overcooked nor undercooked. The aroma cup discloses a gentle aroma of sweet white sugar. 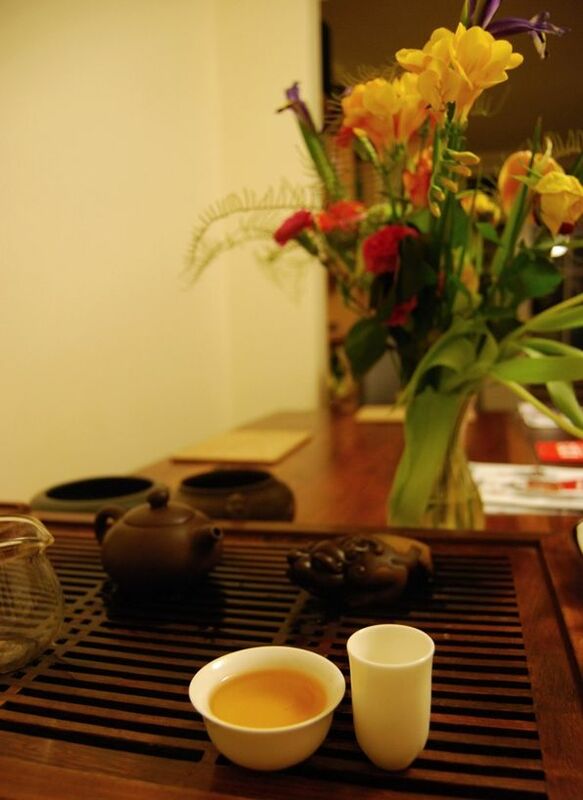 In the mouth, it is an interesting and gradual tea: it opens quietly, but builds to a strong finish. The fruits for which the region is famous build similarly in the aroma. Preventing me from waxing too lyrical is a fairly odd tendency to seem quite caustic, and quite citric in its character. 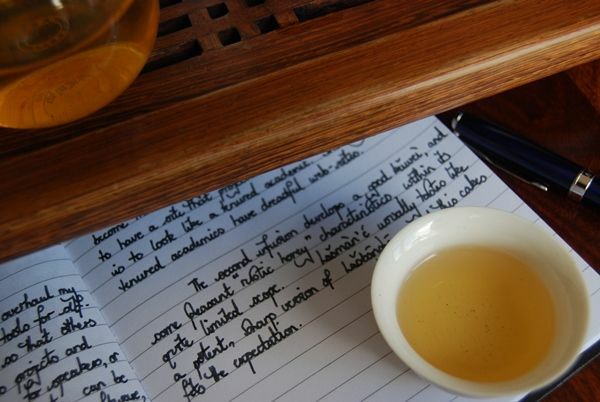 This tartness develops as the infusions pass, and comes to dominate the body of the tea, which, I wrote in my diary, "makes it very difficult to enjoy." The strength is good, but the sharpness makes it unattractive for immediate consumption. This is no bad thing in itself, of course, because it could be that this citric power gives it something on which the aging process can work. That, however, is rather speculative - only time will tell. At a hefty $70 / 357g, the price is rather too high for a gamble. It is clean and strong, but it has the muted body of an autumnal cake compared to the green brilliance of spring leaves. One would have to be particularly brave to gamble so much on an autumnal cake, I suspect. Later infusions do not redeem the cake, and, if anything, the caustic nature builds further. Perhaps these will be golden in ten years time, but I suspect that this may be my last interaction with this cake for quite a while. An interesting, if not entirely magical, experience with a collection of leaves that were quite the prettiest that I have seen in a long time. 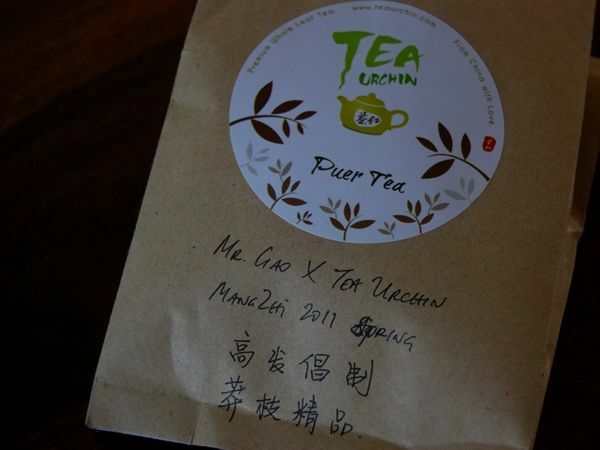 2011 Gaofachang "Mangzhi Spring" and "Yibang Autumn"
Tea Urchin sells a few cakes from Gaofachang, a local producer that Tea Urchin's proprietor, Eugene, met in Yunnan. Mr. Gao knows how to make pu'ercha. 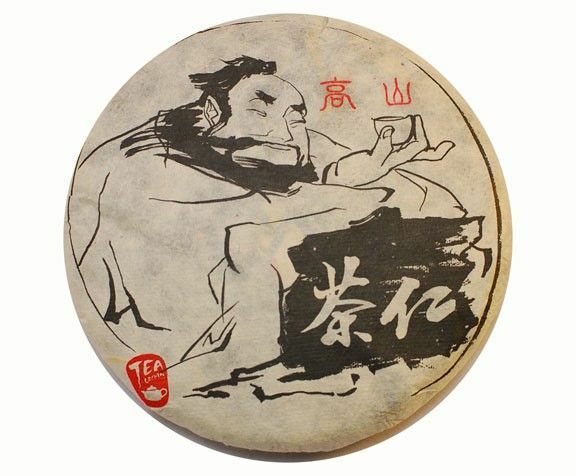 His cakes stand head-and-shoulders above much of the other cakes on sale at Tea Urchin, and this article summarises my experience with two of his oeuvre: a Mangzhi cake from spring, and an Yibang cake from autumn. Let's get our Gao on. You know me - I started with the springtime cake. 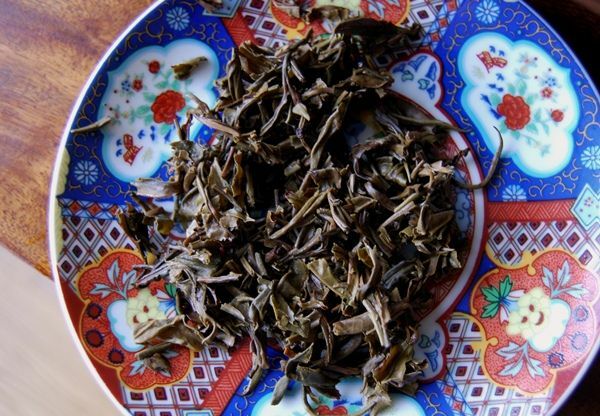 Mangzhi is one of the (in)famous tea mountains of Mengla County in south-east Xishuangbanna, where so much pu'ercha derives. Casting your eye over the leaves below, you would be forgiven for falling instantly in love. The cake is made from an eclectic blend of all types of leaves with, as you can see, plenty of stalks. The leaves have an honest, dark-green shade, and they are long and furry - indicative of good handling. They have a sweet scent that reminds me they are still very much "alive". The first impression, then, is excellent. For $102/357g, which is rather a high price, we'd certainly hope for such an impression. The image shown below represents the colour of a later infusion after sitting in the air for some time; when poured from the pot, the soup is a crystalline yellow shade. Much like Scott's Yunzhiyuan cakes and the cakes from Essence of Tea, this Gaofachang cake has a big, buttery aroma, suggesting just the right amount of time in the wok: enough to prevent hongcha redness, but not so much that it tastes cooked. Perfect - and hard to achieve. I wrote "Clean, incisive, slightly 'soapy', with excellent low tobacco and plenty of shengjin [mouth-watering characteristics]." I piled more leaves in when it became obvious that I would not be punished by an excessive kuwei [good bitterness] for doing so. The "soapiness" is not in the least bit negative: it is a smooth sweetness. 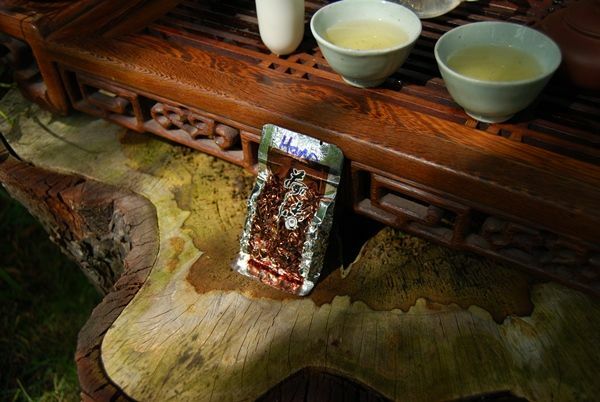 The generously-textured sweetness of this charming, reasonably potent tea, continues well with the passing infusions. So, then, to Mr. Gao's autumnal example. It is from Yibangshan, which is actually rather close (in the grand scheme of things) to Mangzhishan. The price is a moderately substantial $85/357g - certainly quite a high price for an autumnal cake. What's this in the above photograph? Sunshine and grass?! Surely not! It seems that even England can experience a little direct light from the sun, every now and then. 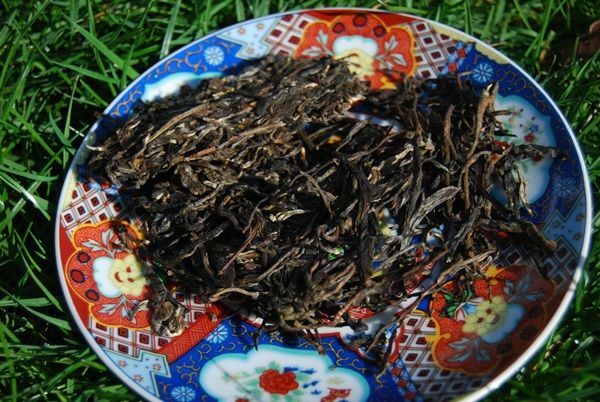 The neighbouring areas of Yibang and Xikong are typified by small leaves, as shown in the image below. They are superbly green, which is a magnificent sign that shaqing [kill green] has been performed adequately. Again, I am reassured by Mr. Gao's processing prowess. A sweet fruitness about the leaves suggests that all is well. The soup is clean, sharp, and very yellow. 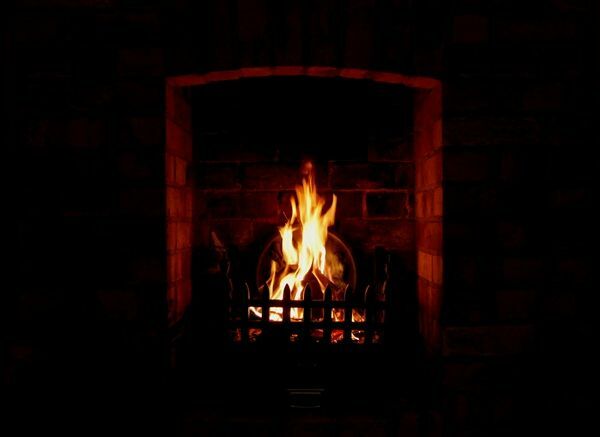 I chat to my dear wife, and it gradually slides into an orange as the action of the air alters its colour, as shown in the photograph below. As with the springtime cake, I am impressed by the butteriness in its aroma that confirms all is well with Mr. Gao and his wok. "Fruity, dense, with an interesting base of tobacco hints", notes my diary, "all wrapped up in the tense butteriness of good handiwork." The kuwei [good bitterness] builds in subsequent infusions in a manner most pleasing. 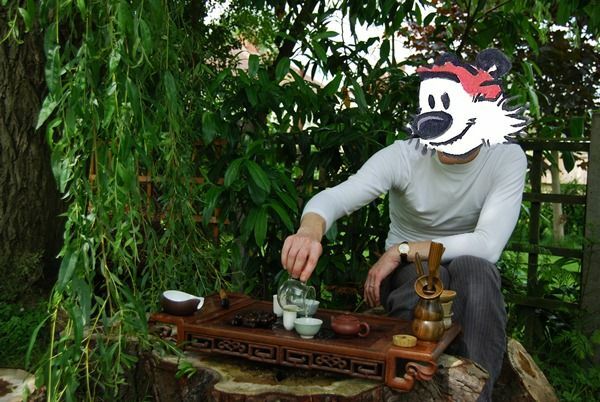 I enjoy a half-dozen infusions before scuttling off to my laboratory, where I continue to brew it in the background. Even under those less-than-ideal conditions, it impresses with a clean, sweet, and enduring soup. Thumbs up for Mr. Gao's pair of highly enjoyable cakes. At the time of writing, these appear to have either sold out or to have been explicitly removed from the Tea Urchin web-site; I hope that a cake or two become available in future, because it would be good to own one for the record, even though the price is a little on the high side. 2007 Mengyang Guoyan "Bulang Long"